If you tick off the Chinese government, they just might send soldiers armed with “non-lethal” laser-powered rifles that will set you to fire to correct your behavior. According to South China Morning Post, the new high-tech weapon is dubbed the ZKZM-500 and the “laser assault rifle” has similar dimensions to that of the AK-47. The weapon allegedly weighs about 3 kilograms (6.6lbs) with a “caliber of 15 millimeters” and it is powered by rechargeable lithium batteries that allow for 1,000 “zaps” that last 2 seconds long each. From 800 meters (about half a mile) away or less, the rifle can burn through a target’s clothes and skin and, if their clothes are flammable, set them on fire, according to reporting done by The South China Morning Post. 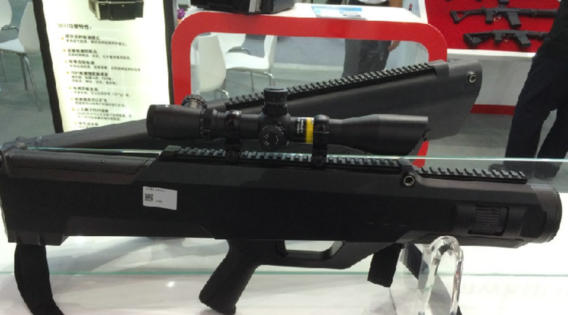 ZKZM-500 is reportedly now ready for mass production and to be used by China’s military and police only (not a big surprise there since we all know that the slaves don’t get any form of protection against the ruling class). But maker ZKZM Laser hasn’t found a licensed partner yet. so it may be some time still before the Chinese police and military start setting those who irritate them by living freely on fire. This article was posted in AK-47, Burning, China, chinese, dangerous, dystopian, government weapons, Headline News, laser powered, rifle, set people on fire, Statism and tagged War. Bookmark the permalink. Follow comments with the RSS feed for this post.Comments are closed, but you can leave a trackback: Trackback URL.